Which outfit from Attack of the Clones is your LEAST favourite? What hairstyle is your favourite? My favorit clothes of Padmé. I have not put them in order of favorites. Which is your favorite? 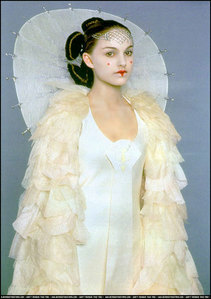 My favourite Padme's costume from each movie ... Which one do yout prefer? Will anda gabung MARA JADE SKYWALKERS spot?? Will anda gabung BEN SKYWALKERS spot? Is Neberrie Padme's middle name? If not, what? Padmé Amidala was sitting in the living room of her spacious apartment complex waiting desperately for word form her faithful droid C-3PO on when Captain Tyhpo's speeder was coming. She had just gotten the information a few hours into that morning that the two heroes of the Clone Wars Obi-wan and Anakin had rescued Chancellor Palpatine and were coming back to Coruscant that very evening. Ever since she had gotten this information Padmé hadn't moved form her spot on her living room sofa expect when it was absolutely necessary. A discussion about Padme's portrayal throughout the movies, and some of the, well, complaints raised about her at times. I can't say I agree (e.g. the arena outfit, etc. ), but it's interesting nonetheless. a comment was made to the poll: Which Walt disney Princess would anda say she resembles the most personality-wise? a comment was made to the poll: Favourite hairstyle from episode 3: your choice? Which country was Padmé's Parade gaun inspired from?